While listening to “The Nerdist” podcast at work today the interview with Joe Maganiello slowly moved from stealing comic books, hanging out with Schwarzenegger, to the glory of the WWF. A good portion of the interview focused on one the greatest showmen of wrestling Randy “Macho Man” Savage. Wrestling has lost its flavor. I stopped watching it maybe 4 years after it got absurdly ridiculous and, video games started to take up most of my time heh heh. However, watching the Macho Man wrestle was awesome with his famous flying elbow drop, Ms. Elizabeth accompanying him at the ringside, but his trait was his interview skills. The way he would annunciate and respond to “Mean Gene” Okerlund and threaten his opponents was intriguing yet hilarious at the same time. 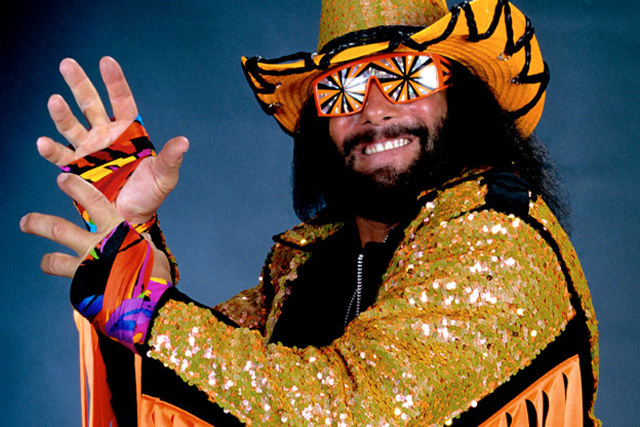 Let us remember the “Macho Man” by viewing one of his most famous interviews attached below.